Duck, jump, and die as you face obstacle after obstacle in this runner. You are an Owl. You are trapped between your nest and the sea in a massive hurricane. This game takes place entirely in the credits screen of a video game. Sometimes, an obnoxious injustice can create life where it's totally unexpected. An homage to an excellent fighting game played on One Screen in the old Commodore days. We are glad to present you our first game! Inspired by the reflections of the infinite and Nolan's masterpiece. The main objective of the game is to prevent the enemies from capturing the territory. It is an endless shooter game. Play as a dog who shoots bark beams at all the enemies on the one screen! This game was programmed in C# and only uses WinForms. It should be able to run on Linux and OSX using Mono (http://mono-project.com). Defend your castle from coming enemies by throwing stones to them. We proudly present you: A carrot game! How good are your reflexes? And your arithmetic skills? You can test both with SPIN-2, a fast-paced game that reacts with the music. Soon, on a computer-screen near you: SPACE OPERA. 2-6 player local turn based strategy game. //if parse error // try again downloading the app completely and install it. I’ve actually completed LD31 despite a cold :D.
And here is the wonderful Super Carrot Farming 3000 Deluxe !! The best farm defense game ever ! Smash, shoot and bounce in space. Bounce em up is an arcade physics based local multiplayer shooter! Collect the wreckage of fallen spacecraft to find your way home. W,A,S,D or arrow keys to dodge. Square is a puzzle game between lumines and the rubik's cube. You have to rotate little squares and create big square of the same color. It's the first time that I participate in Ludum Dare and I finished my first game :D.
Try to avoid the snowballs to save your Snowman! The score is the number of snowball you've avoided. Elf Hunter: Return of Santa is a 3D Top Down Shooter. Blast the evil elves with your laser and impale them with traps. This is my entry for Ludum Dare 31 Competition, themed "Entire Game in One Screen"
BEAT+TRAK is a DYNAMIC music-"rhythm" game for OSX, Win, Linux, and Web! You are a droid, 0x2603, Class Alpha 1. You were created to destroy. You must destroy. But, wait, you remember. Behind this title a bit ironic lurks our first game in a jam like the Ludum Dare. Puzzle game where you have to align two blocks (or more) of the same color. Your marine corp unit is tasked to terminate the social injustice in Cambodia and was ambushed upon landing. You have to spend one week non-stop in front of your computer. You must find something fun to do, before it's too late..
*Note game aspect-ratio needs to be 16:9. Kill all the spaceship with. they want to kill you ! Shmup with 2 maps on only one screen. Collect all upgrades and beat the mothership. MACHO KNIGHT IS HERE TO SAVE THE DAY! Boom Blade Battle Brigade is a 2-4 player last-man-standing bomb-filled extravaganza! Those friendly snowmen have turned on us. It's time to fight back! It's time to cancel the Snowpocalypse!! Silly game about a drunk man, exploding chairs, wild fires, and far-west style saloon.. I suppose the question of "Entire Game on One Screen" could be answered with "How deep is your screen?" My second Ludum Dare entry. I wanna make a Snowmäääään! Build a Snowman with two snow Globe. Point and click your way to Snowmanliness! Dwane P Pipe: "This is the most horribly inappropriate game I've ever played in my life. Disgusting!" 3Scale is an action platform game. Jump around to some cheery chiptune. Click to play in browser! You are a simple pixel flashing black and white who start at the bottom left of the screen and your goal is to go to the top left. Greeny GRUB is a soothing, relaxing web game experience. Just grab (grub!) as many GREENS as you can while dodging REDS. My entry for LudumDare#31, I wish had more time.Please leave feedback. You need to exit the house, being careful with the "enemy", but why you're there? you are human ?. The game is in the name, Play as a stranded spaceship and fight off enemies. Gain points while going around the track without colliding with the wall. Also, the square will keep getting fast from time to time. Robot Karma Joe is a classic platformer/shoot´em up style game where you have to control your soul to beat the intruders! I am very excited to take part to my first LD! Here is my entry! The Storage room, is all about surviving waves of robotic enemies in a storage room. This is also my first ever finished game. This game was made in 24 hours by me. Its a simple top down shooter. arrows to move, a new rule appears each time you reach the goal. I've discovered the reason behind the invisible wall! Blast away the aliens while avoiding their debris. Help Buck defend the planet from the evil alien invasion! Champions League is a battle arena game. This is our attempt at an apartment-neighbours survival game. A man doesn´t want to accept his fate. He plans to escape. Music is a puzzle game about making music. It was made in 8 hours, for the Ludum Dare 31 Competition (2014-12-06). This is Crimsonland like game in survivor mode. Lost Path is a narrative game in which you play a red panda forgotten by his family after a gun shot in the forest during winter. "You're stuck behind enemy lines. Your cover is blown. You're outnumbered and outgunned. All the Game is in the screen, I mean for the computer. Your goal is at the end of the corridor. Just walk, it’s easy, I promise. PS: The game has two endings ! Sad little war-bot returns home to find the other machines have moved on. What's a little war-bot to do when you only have guns for arms? I YouTube hundreds of Ludum Dare games in my video compilation series! A simple game about exploration and one fox's love for snow. See what you can find, and bring it back home. Well, here is Squareon, a game filled with squared-neon. I wanted to create a beat 'em up using a GameBoy look alike. Careful, this game contains violence and blood. Hello this is my second ludum dare. This is infinity mini dungeon game. Survive waves of mobs and try and get the highest score. Play Area is a game where you decide what is and what is not part of the game. Launch the ball with WASD or arrow keys. Click on the arrow to rotate it. This is my Fifth Ludum Dare, and as always I can see that I am improving. 4th Ludum Dare Entry and 3rd one submitted for the jam. This is an easy rage quit game, which will keep your rage level between fairly low and low. New year is coming… But not all children will receive presents because absent-minded Santa keeps loosing gifts on his way to children. This game was made in 9H 26Mn and 9 second. Night is coming ! You are a psychopath and Weird Monsters are coming ! Collect remotes... shoot everything else! Wavy Jumps is an arcade game in which you have to avoid waves and collect bonus to increase your score. How long can you last in Falling Dots? Focus is key to achieving a high score. You have to fill the whole energy bar to advance next stage. The goal is not "living as long as possible". 8/12/14: Bundled versions are now available. In Packaged you are working at a packing factory and your job is to fill orders for the new LD Player game console. For my entry I made an epic RPG game with entire game world on single screen. entry. This game was made for the 31st Ludum Dare game jam. We hope you enjoy! P.Rick Airious has been described as Pitfall meets Super Meat Boy. Pixel perfect platforming action all on a single screen. Maze, adventure...interactive prose poem? Explore The Tower and decide for yourself! 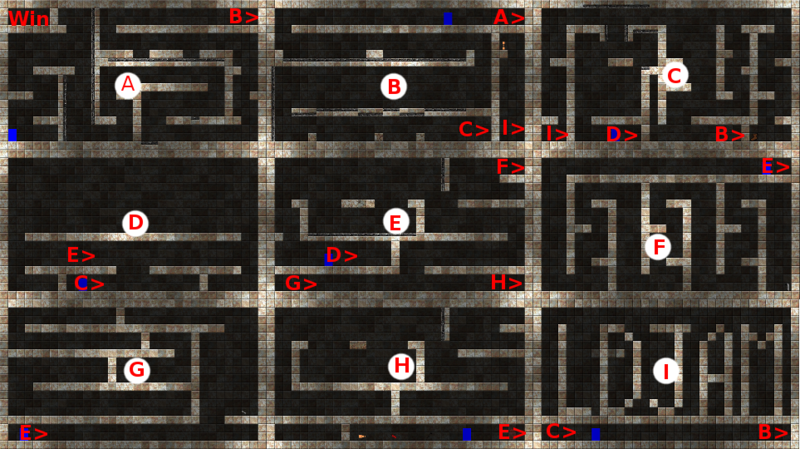 Mazimon was intended to be a mix between mazes and the game simon and resulted in a fast paced maze solving high scoring game. Zombies 'N Spies is a stealth and survival game in one.